Home » Blogs » Eileen's blog » Meat Free March - My Top Tips! Have you considered trying out plant based eating but been a bit unsure where to start? You’ve probably seen articles on the internet and one of the many movies around that show how plant-based eating has really come of age, the evidence that it is simply better for our health cannot be refuted. I realise it’s not simple for many people to give up something they have become accustomed to, meat is part of many cultures and it seems very odd indeed to have a meal where it isn’t the star. But do we need it? No way. Is it actually good for us? Um, sorry to say but no, it really isn’t. Meat is linked to many lifestyle diseases and has been named a probable carcinogen. There is nothing you can’t get on a plant-based diet with the exception of Vitamin B12 (and that’s simply because our dirt is lacking in it these days- it’s nothing to do with animal flesh, it's just the way the animal synthesises it). I can assure you that you can get plenty of calcium (milk as a crucial source of calcium is an absolute fallacy, fear not! ), iron and every other vitamin and mineral you care to name. The key is VARIETY. Come on now, Oreo’s are technically vegan but let’s be real here, eating a rainbow every day is going to give you serious cellular energy whereas Oreo’s – not so much. Firstly, let me reassure you, you aren’t going to have to give up everything and it’s not some kind of trial you have to endure. You’re going to LOVE it! While I’m calling it Meat Free March, the objective here is to go completely plant based, so that also includes dairy and eggs. It’s really worth trying to eliminate all these things to really see how plant based eating makes you feel. I’m also focussed on Whole Foods rather than processed BUT I do see some things such as fake meats as having a place for people who are transitioning, so please go to town on that if you feel the need, just make sure you add a huge salad with whatever you’re frying up! I thought I’d start with some ideas of how to ‘normalise’ meat free eating in a way the whole family can enjoy- and if you can’t get them across the line, there’s plenty of scope to create your own meal within a meal! 2 Cups Frozen Blueberries (I use Spray free from Otway Blueberries- local is best! You can also give your bowl a nationality and formulate everything around a certain cuisine. Taco night! This is the perfect way to line up a great spread of colourful plant foods including refried beans, pinto beans, grilled mushrooms, capsicum, grated carrot, avocado, salsa, lettuce - let everyone choose their fillings and enjoy the variety. 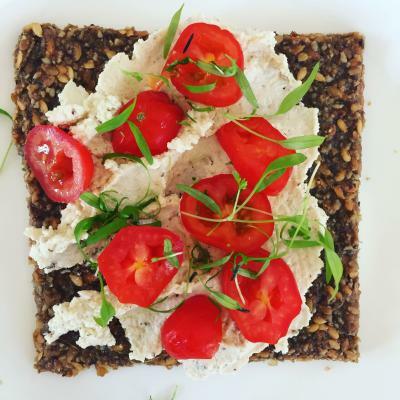 Replace Sour Cream with Plain Coconut Yoghurt , grab one of the many types of shredded vegan cheese available now and use that- you honestly won’t know the difference! Fake Meat- has its place! If you’re after sausage rolls, there are a few varieties available now and you truly wouldn’t notice the difference- after all, sausage rolls are about a savoury filling, a flaky pastry and tomato sauce right? Not saying this is a particularly healthy choice, but if you’re looking for an ‘instead of’ it’s a good bridging option. There are also heaps of vegan pies and sausages available in the freezer of most supermarkets as well as ‘mince’, so if you want to simply replace a regular meal with a meat free alternative, it’s that easy! Sweet treats- are pretty easy really, jump on here to check out some of my recipes, or you could just try making Banana Nice Cream by blending frozen bananas with your choice of other fruit and eating it nice and cold - so simple and so YUM! Eating out – is so easy these days! I generally call ahead because that ensures the chef has time to plan something, but most of the time there is something plant based on the menu or something that can be easily adjusted. Takeaway is also pretty easy too, on the odd occasion that I do, I’ll be likely to go for a Veggie Vitality at Grill’d- this is the bomb especially of you want to feel you’re still having a burger like you may be used to- even my hubby is a convert! So, the main thing here is, don’t make it a big deal! Just pack the fridge with goodies, allow yourself some time on a weekend to prep your veggies for a few days ahead, do a meal plan, make little snack packs, promise yourself you’ll eat way more than ‘5+ a day’ and keep a diary to see how you feel, especially if you’re doing any sports because as we are now seeing, many sports people are finding huge benefits eating a lower inflammatory diet and discovering- shock- horror- they CAN get enough protein!